As a wide-eyed undergraduate physics student getting introduced to scientific research, the following proverb was drilled permanently into my head: no measurement we could possibly make in this imperfect world — the cup of flour that our recipe calls for, the pencil marks on the wall indicating the annual growth of our child, the 10 gallons of gas that we were led to believe just went into our car tank — is ever exactly the “true” measurement, but rather is a value with some “give or take” (aka, uncertainty) associated with it. And that amount of tolerance shall always be attached to any measurement! After my recent OCT eye scan last week, I’m wishing that students in the medical field had the same borderline-unhealthy obsessions about uncertainty. The question was not if my eyes showed atrophy, but if they were continuing to degrade or if this damage was done in the past and my eyes were holding their own. A year has passed since that first OCT scan, giving a hint of what the answer is to this question. But as you will soon see for yourself, some knowledge of what the uncertainty is in the OCT measurements would be incredibly helpful, to be able to determine if the change seen between the scans taken a year apart are real, or just random fluctuations and not to be a source of any concern. Alas, the optometrist didn’t know the level of accuracy of these measurements. So all that we have to go on, really, are 3 measurements: one taken in July 2012, another in December 2012, and the one taken last week in Aug 2013. The measurements appear to show a trend: the RNFL in each eye appears to be getting thinner. 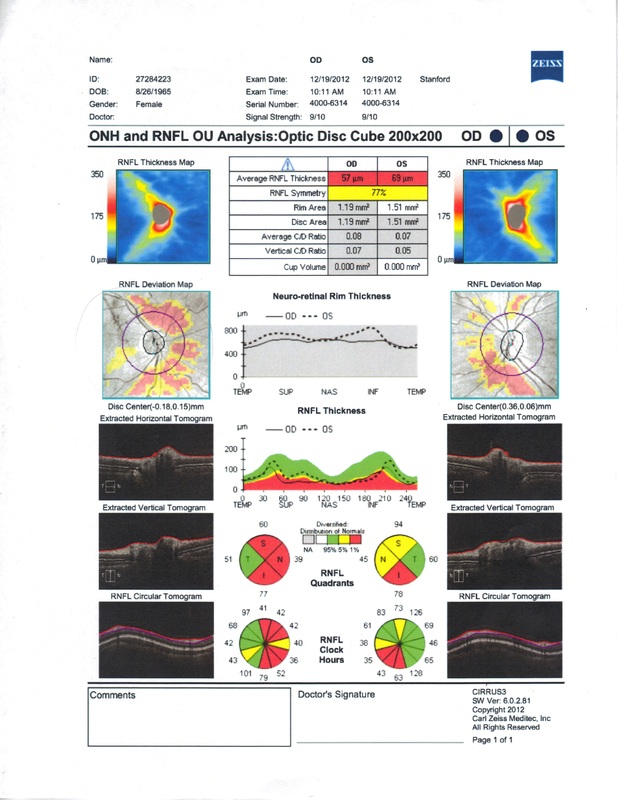 Just taking the numbers at face-value, one eye appears to have lost as much as nearly 2-3 microns over the past year. To put that value in perspective, a normal amount of loss due to aging is about 0.2 microns per year, meaning my eye has lost over 10 times more axons than what would be considered normal. But then again, if these measurements have uncertainties that are at least plus-or-minus a few microns, then this apparent decrease is nothing more than a statistical “fluke” and no cause for alarm. 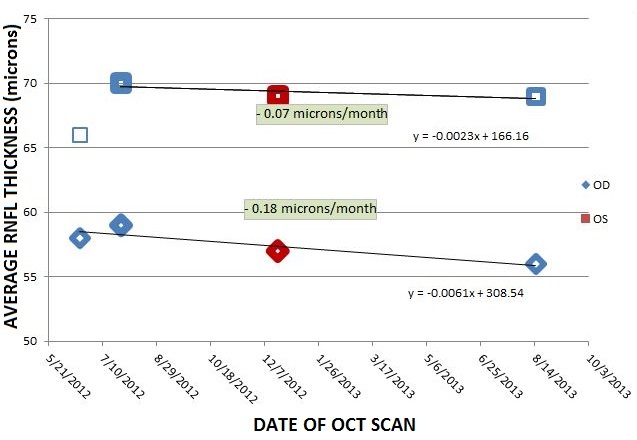 In the below figure, I plot up all the OCT measurements of average RNFL thicknesses to date. The squares (along the top) are the average RNFL thicknesses (in microns) for the left eye, the diamonds (lower points) are of the right eye. The blue symbols represents measurements taken with one machine, the red are measurements taken in a different doctor’s office (noted in case there are systematic differences in the way 2 different machines make the measurement). The symbols that are nearly completely filled indicate high-quality measurements (the OCT scans rate the quality out of 10 points. The best measurements in the below plot were 9 out of 10), and the symbols that are barely filled are low-quality (the nearly-empty square is a 7 out of 10). The lines show the best-fit to the data points, with the resulting atrophy rate indicated in the text boxes in units of microns per month. As you can see, in a single month, the right eye appears to be losing nearly as much as a healthy eye would lose in a whole year. The left eye has a slower rate, but the loss is still about 4 times faster than what is considered to be normal. 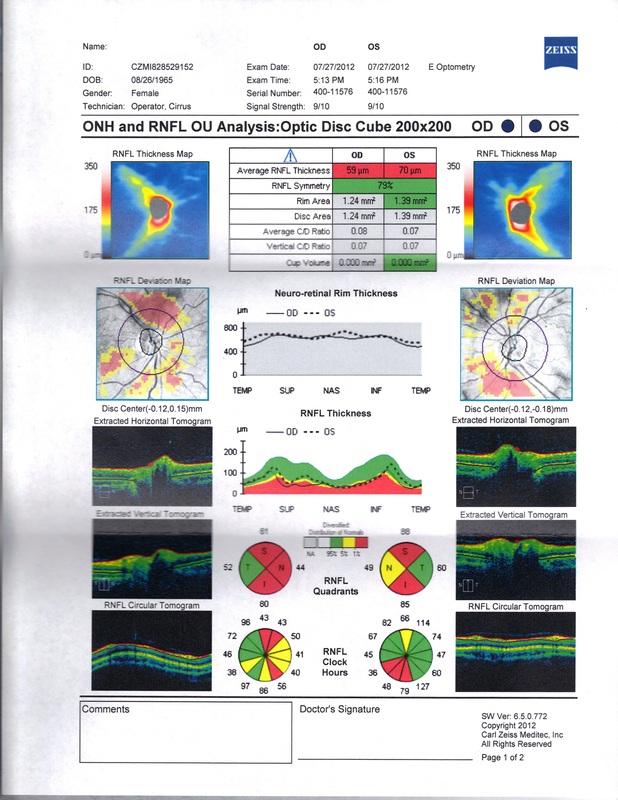 The next plot is another summary chart that I put together to show, at a glance, the changes of the RNFL thickness around the eye. These plots are color-coded such that green is good (healthy thickness), yellow is “iffy” (below average thickness) and red is bad (significantly below average thickness). The plots are made in the form of a pie, indicating how the thickness of the RNFL varies as one goes around the optic nerve. On the top row are the first measurements taken in July 2012, the middle row are the tests taken in Dec 2012, and the bottom row are the results from the most recent Aug 2013 scans. The main thing to notice is that the number of yellow or red pie slices increases in going from the top (July 2012) to the bottom (Aug 2013) — not the result I was hoping for. 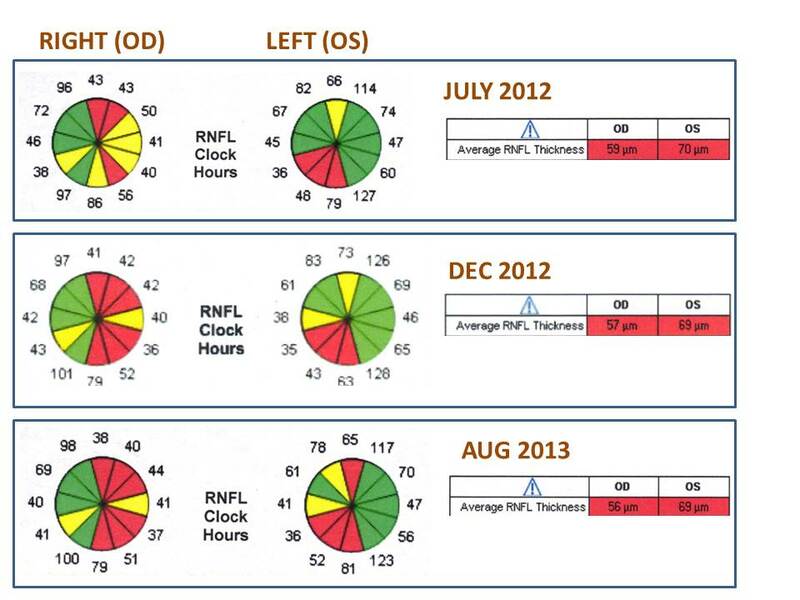 Looking closer, there are a couple of notable details: 1) the right eye seems to have gotten worse between the July 2012 and Dec 2012 tests (more red slices show up in the Dec 2012 result), but then seems to have slowed down a bit in its degradation (the pie colors remain the same between the Aug 2013 and Dec 2012 scans); 2) the left eye seems to be getting progressively worse on the nasal side (which is on the left side of the pie charts that are under “LEFT (OS)” in the figure below), as indicated by the increase in yellow and red slices from one month to the other. Needless to say, more data is needed for a definitive conclusion (perhaps not surprising, given that we astronomers are always joking about the fact that no matter how much data we have, we always claim that we need more!). If the next OCT measurement (scheduled for December) is smaller than the August value, then I think that a downward trend will be difficult to dispute. 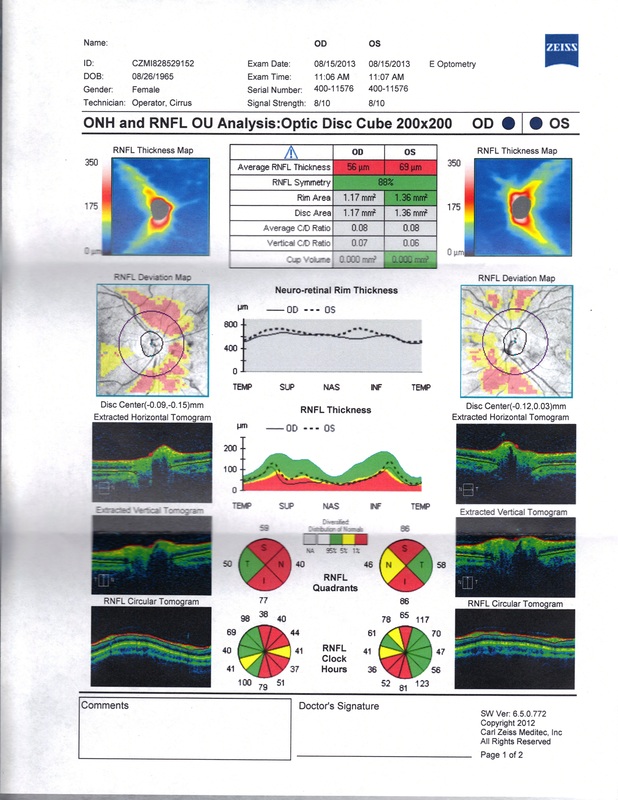 If such a result arises, then I will become significantly more aggressive in finding an underlying cause for the optic atrophy (is it really “just” MS? Is it glaucoma or something else?) and a suitable treatment (is Copaxone really up to the task? I don’t think so, if my eye shows further deterioration in future OCT tests).